UPDATE: The 2nd Edition is now under contract! Stay tuned for updates. Use the code WILT9469 for a 35% discount when you order the book. Welcome to the official website for The CUDA Handbook. 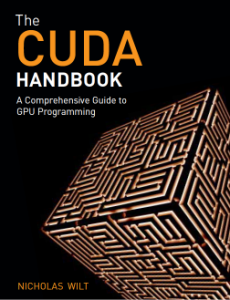 The CUDA Handbook, available from Pearson Education (FTPress.com) , is a comprehensive guide to programming GPUs with CUDA. It covers every detail about CUDA, from system architecture, address spaces, machine instructions and warp synchrony to the CUDA runtime and driver API to key algorithms such as reduction, parallel prefix sum (scan) , and N-body. Detailed descriptions of every CUDA abstraction and how it maps onto the hardware. Microbenchmarks to measure performance of everything from peak global memory bandwidth. Microdemos to illustrate in-depth the workings of features such as texture-mapping and the new warp shuffle instruction (new in SM 3.0). Detailed descriptions of key parallel algorithms, such as reduction, Scan, and N-body, with source code implementations. It covers CUDA in the Cloud, focusing on Amazon’s CUDA-capable EC2 instance type, cg1.4xlarge. The source code accompanying The CUDA Handbook is open source, available on github. Check out The CUDA Handbook blog! Like The CUDA Handbook on Facebook! Follow The CUDA Handbook on Twitter (@CUDAHandbook)! Errata may be found on this page. If you have new ones to report, please send email. Nicholas Wilt was on the inception team for CUDA, starting in 2005 and continuing work on it until he left NVIDIA in late 2010. As the primary architect of CUDA’s driver API, he is responsible for most of the low-level abstractions that CUDA programs deal with: from contexts and modules to streams and events, portable and mapped pinned memory, CUDA arrays and texture and surface references. Before joining NVIDIA in 2002, Mr. Wilt worked on multimedia at Microsoft in various roles. Among other things, he was the development lead for Direct3D 5.0 and Direct3D 6.0, worked on the Video Mixing Renderer (VMR) that shipped in Windows XP, and built a prototype page-flipping desktop that eventually became the Windows Desktop Manager.